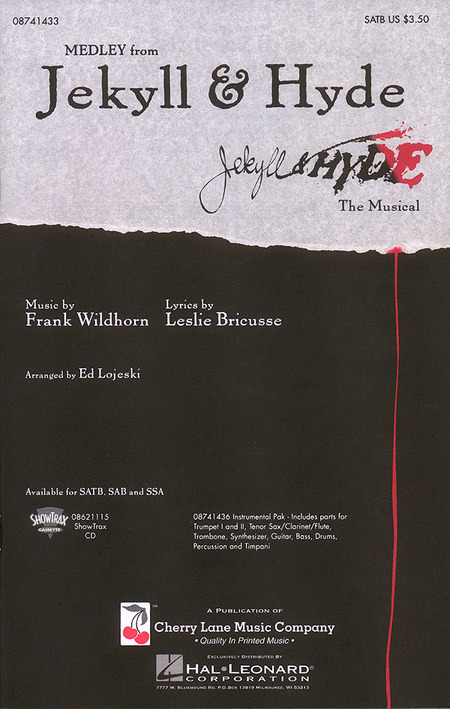 Jekyll & Hyde is a musical thriller based on the novel The Strange Case of Dr Jekyll and Mr Hyde by Robert Louis Stevenson. Originally conceived for the stage by Frank Wildhorn and Steve Cuden, it features music by Wildhorn, a book by Leslie Bricusse and lyrics by Wildhorn, Bricusse and Cuden. Following a world premiere run in Houston, Texas the musical embarked on a national tour of the United States prior to its Broadway debut in 1997. Many international productions have since been staged including two subsequent North American tours, two tours of the United Kingdom, a concert version and a re-vamped US tour in 2012 ahead of a 2013 revival on Broadway. The 25th anniversary production is slated for release in 2016. 19 selections from the recent Broadway revival of the hit Wildhorn/Bricusse musical are featured in this collection, including the popular songs Someone like You and This Is the Moment, plus: Alive! - Bring on the Men - Confrontation - Facade - In His Eyes - Letting Go - Murder - A New Life - Once upon a Dream - The Way Back - and more. Features 15 songs not included in the Broadway production: Bring On the Men - Girls of the Night - Hospital Board - I Need to Know - It's Over Now - Letting Go - Love Has Come of Age - Possessed - Retribution - Seduction - Till You Came into My Life - Transformation - We Still Have Time - and more. Includes an article by Leslie Bricusse, comments on each song by Frank Wildhorn, biographies, and international program covers. Here is the music from this dark and dramatic Broadway musical in a well-crafted medley by Ed Lojeski. Explore the deep passions and powerful secrets of this classic tale told through music. Includes: Alive! ; Facade; Murder, Murder! ; A New Life; Once Upon a Dream; Someone Like You; This Is the Moment. Available: SATB, SAB, SSA, Instrumental Pak, ShowTrax CD. Performance Time: Approx. 10:30. This extraordinarily beautiful song will create a shimmering moment in performance. Ideal for graduation and many other concert occasions, your singers will shine! Available separately: SATB, SSA, ShowTrax CD. Rhythm Section parts available digitally (pno, b, dm). Duration: ca. 4:30. 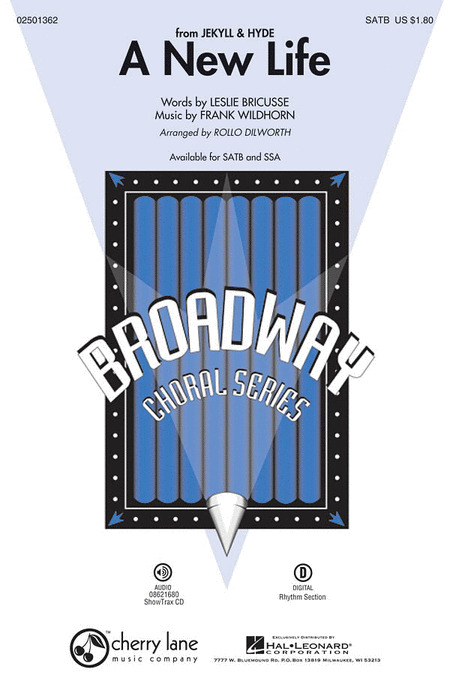 Specifically designed for singers, this book offers 8 songs from the show in their original keys. The sheet music includes the vocal line and lyrics, along with a piano accompaniment that's a reduction of the original orchestral score. Singers can have a live pianist accompany them, using the music in the book, or use the CD, which features a full performance of each piano accompaniment. Songs: In His Eyes - It's a Dangerous Game - A New Life - No One Knows Who I Am - Once upon a Dream - Someone like You - Take Me as I Am - This Is the Moment.